Unnata® Aerial Yoga offers an authentic Yogic experience, working with an Aerial hammock, and the support of gravity, to relax and realign the body, center the mind, and uplift the spirit. Whether you are a long-time Yogi, or dreaming about trying Yoga for the first time, the Unnata method is a fun and playful way to discover this ancient art from a new perspective. The Unnata method is more than an Aerial Yoga class. Beyond flips, tricks and pretty poses, the Unnata method teaches deeper body awareness in multidimensional space. Surrendering into the hammock, you’ll gain insight about how you hold your posture, where you’ve held chronic tension, or how you habitually move through space. The Unnata method guides you to unwind old physical patterns, and reset to your body’s true alignment. You can expand flexibility, increase range of motion, build strength, lengthen the spine, and relax the nervous system. Since 2006, Michelle has taught the Unnata method, and trained teachers across the globe. Now Unnata Aerial Yoga has evolved from Michelle’s playful practice of discovery into a mature method of Yoga, with teachers in 30+ countries worldwide. Michelle continues to innovate the Unnata method, and lead the Unnata community. Though Unnata Aerial Yoga has gone global, it remains a small organization, guided by Michelle’s vision, and the support of an intimate group of dedicated teachers. With only 6 Unnata trainers worldwide (including founder, Michelle Dortignac), Unnata Yoga is not a factory churning out teachers; it’s a community of dedicated Yogis, inspired to share a love of the Unnata method with students everywhere. Unnata Yoga teachers are devoted, experienced yoga instructors who have completed thorough training to safely incorporate the hammock into their yoga classes. Each teacher has a unique background and style of yoga; but all Unnata Yoga teachers understand the principles of yoga, and can safely guide you through a playful and transformative Unnata Aerial Yoga class. In an Unnata Yoga class, you’ll ground as much as elevate, and balance both earth and air. You’ll explore new and traditional asanas in the hammock, and on the mat. All the subtlety you discover while suspended can be applied to asanas on the ground, and all the technique you master on the mat can support your posture in the air. With the support of the hammock, you can refine your regular practice, and explore advanced asanas that might not yet be accessible on the ground. Advanced asanas can take years to learn, and even more time to understand their benefits; Unnata Yoga speeds up the process in a fun and safe manner. You can immediately discover fine balance, increase strength, deepen flexibility, and more easily invert. These skills extend to all physical activity, and result in more fluid movement through life. An Unnata Yoga class doesn’t just take you into yogic poses, it teaches subtle distinctions about why and how these poses benefit you physically, mentally, energetically, emotionally and spiritually. Elevating your asana brings you into keen awareness of your center; it aligns the body, soothes the mind, deepens the breath, and heals the nervous system. Be playful and challenge yourself! In an Unnata class, one thing will remain consistent, no matter who your teacher, or where in the world you practice: you’ll get an authentic, inspired experience of supported Yoga, based in Unnata Yoga’s foundational principles: relax into gravity, realign the spine, rebuild strength, and repeat. Just like traditional Yoga, the Unnata method can meet you where you are, no matter what your level of fitness or Yogic experience. Our Unnata teachers bring their passion and expertise to the method, and because each teacher is unique, you’ll find that our classes are as diverse as our community. Some Unnata Yoga classes are gentle and meditative, others strengthening and challenging. Some classes may focus on building a skill, like supported handstands, or deeper backbends, while others melt you into restorative bliss. Unnata Aerial Yoga is a perfect opportunity to challenge yourself, be playful, and learn something new! 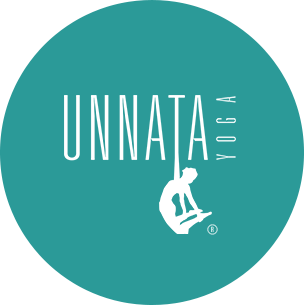 Who is Unnata® Yoga For? Unnata Aerial Yoga is uniquely developed for all levels of experience. No previous aerial, acrobatic, or Yoga experience is necessary. Unnata Aerial Yoga is not recommended for individuals who have high blood pressure, cataracts, are pregnant, or anyone for whom hanging upside-down could cause medical complications or discomfort. Ready to try an Unnata class? Come soar with us! It could turn your world upside down and be the most fun, challenging, and inspiring Yoga experience you’ve ever explored. Go here to find an Unnata class near you. If you’re already certified to teach Yoga, and you’re inspired to offer Unnata classes, dive in to an Unnata Aerial Yoga Teacher Training! You’ll develop the skills to deliver safe, effective, fun Unnata classes to your students, and grow into an even more capable, confident Yoga teacher, no matter what style of Yoga you teach. 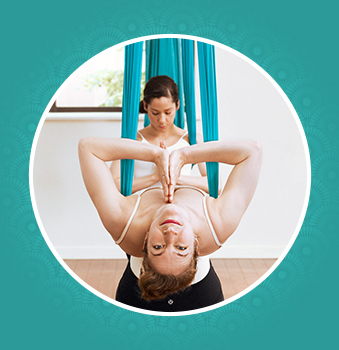 Learn more about our Unnata Aerial Yoga Teacher Training, or find a Teacher Training program. “Unnata” is the Sanskrit word for “elevated,” meaning both elevated in spirit and physically elevated. The “U” sounds like the “u” in blue and rhymes with zoo, too. The rest sounds like “not,” followed by “ahhh.” Put the emphasis on the second syllable; “ooo-NOT-ahh” — Unnata.